If you don't like pancakes, we can't be friends. Just kidding! But seriously, who doesn't like pancakes? My daughter is extremely picky, and I can't blame her because I'm the same way. We have a lot in common and disliking meat is one of them; we don't hate it but we certainly are not carnivores. Neither of us seem to really enjoy meat and I was worried about our protein intake. That's when my sister told me about Kodiak Cakes, I figured if I liked them she would too. I was right! She LOVES them. It's the first thing she tried that she doesn't immediately feed to the dog, that's a win in my book! The recipe to making the perfect pancake is simple with Kodiak Cakes, I'm no Martha Stewart, I can't even use an Easy Bake oven properly. It's literally 1/1. As much powder as liquid, or for every 1/2 cup it takes one egg. Unless you cook on high heat, forget to grease the pan, or leave the house with these on the stove it's nearly impossible to screw it up. 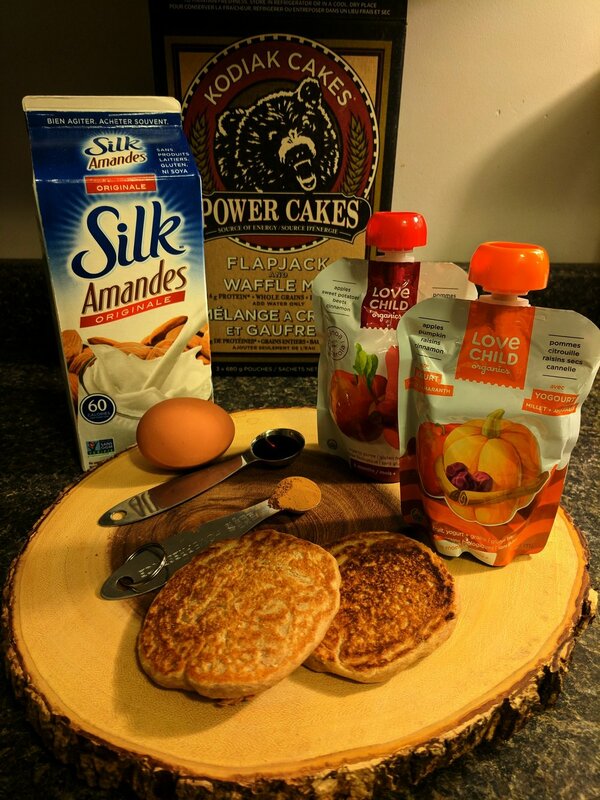 She is not allowed to have syrup, so, a way to take away from the dryness of a plain pancake while also masking nutrients is to use a fruit sauce, yogurt, nut butter or, dress it with one of Love Child Organics/Baby Gourmet (etc) food pouches. Get this reaction ⬇️ and feel good about what you are feeding your baby!